The last couple of weeks I have been hearing only about GDPR. My inbox has been filled with subject lines requesting to accept this new beast from various websites. This flood of emails brought me the awareness that how many subscriptions have I signed up in the past years. It’s way too many people! Since I have two blogs of my own, I too am required to make my sites GDPR compliant. Though it is mandatory only for the European Union if you have subscribers from the EU your website should be GDPR compliant, otherwise prepare to face the consequences. And we have time until the 25th of May 2018. That’s what I understood. See, I am not a legal advisor. All these information I got from a dear blogger friend, Shailaja and from browsing the internet. I am sure Shailaja would come up with a much detailed tutorial on the whats and hows about GDPR. Below I am talking about what I did to make my sites GDPR compliant. If you have any more information please do share in the comment section. 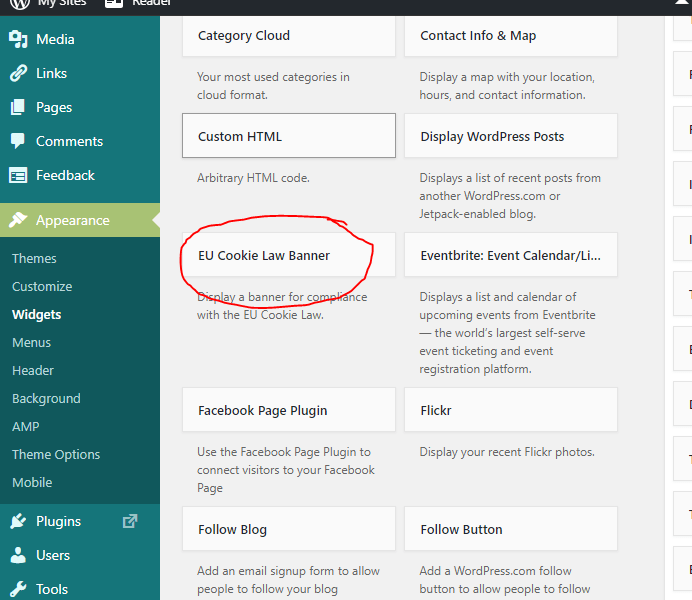 Added EU Cookie Law Banner widget – Jetpack has this new widget which can be used for both the self-hosted blogs and the WordPress hosted blogs. I added this widget to both my blogs – this one which is self-hosted and Void Thoughts which runs on WordPress. Update WordPress to version 4.9.6. 3. 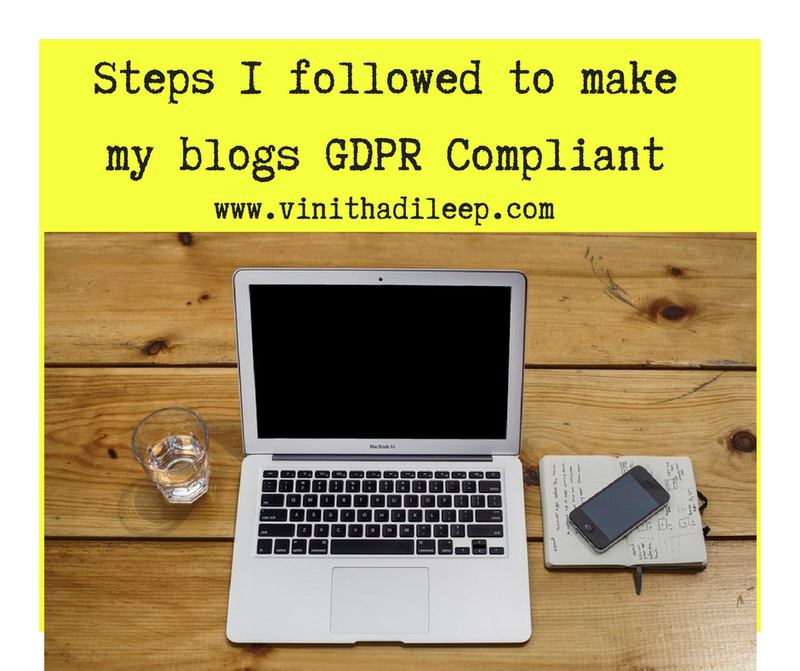 Installed WP GDPR Complaint plugin for self-hosted blogs – Once you do the necessary settings on this plugin a checkbox to confirm the user permission to store and handle the data will be displayed. Click on the settings of the WP GDPR compliance plugin under the installed plugins tab. Click on the Checklist tab on the WP GDPR compliance plugin. Below image shows my settings. Depending on the data you handle choose yes or no. Click on the Integration tab and choose Enable and Activate form wherever applicable and save changes. This GDPR thing is a pain… we are having such a issue wigh it.. with 25th may fast approaching. It would be interesting to see the first case that goes to court.. I agree, GDPR is a pain and the deadline is not making it any fun! Thanks, Vinitha for compiling this informative post. I am planning to do this GDPR thingy today and I’m going to come ack again for reference. Uh,oh.. I have two blogs. Phew! So well detailed, this post! Great job on it, Vinitha. I need to figure out how this works for blogspot now. Thanks for this post. I have been reading up but still find it complicated. Plus I have not been able to send a mail to my subscribers about it so….all the more mess. Hopefully will solve it with your post now. Great post, Vinitha. I love the step by step process you have shared. Very helpful! 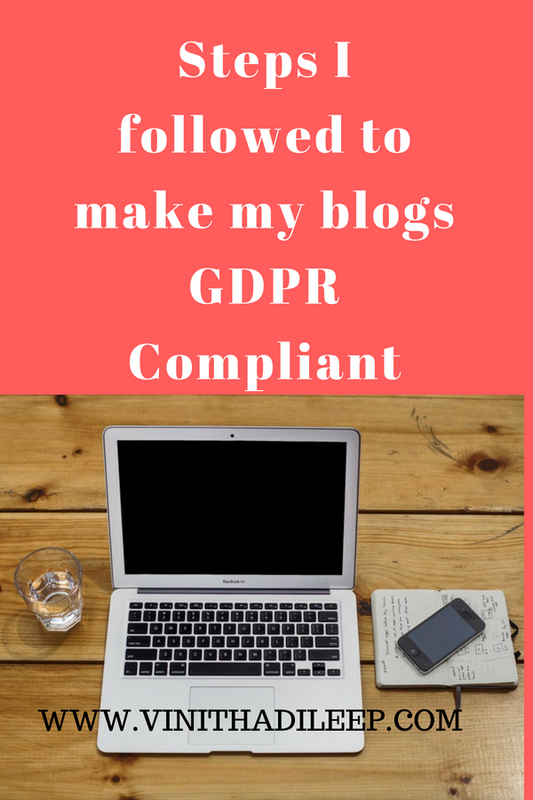 I just completed the basics of GDPR compliance for both my blogs. Phew! Thanks for sharing, Vinitha. I have yet to do this. This is so helpful! Thank you for breaking it down into east to underest and & follow steps! I have followed everything you mentioned !! Big Thanks to Natasha from natashamusing.com for helping me out by sharing this article. So wonderful of you to share this with us. Thanks for the info., but the date is over.I saw it now only.